Many thanks to John Mutch and Steve Tompkins who dug up some Rode family biographical data for me. It seems the "W" stands for William. Included were the names and birthdates of Rode's two children, but they were born in the early 1880s, 130 years and several generations ago. I'm not sure how fruitful it would be trying to track down descendants - there could be 50-100 of them living today. Thanks also to Mike Paradis for tracking down some numismatic literature auction references to books from Rode's library. The American Numismatic Society obituary for Rode (kindly furnished by librarian Elizabeth Hahn) provided me a clue for a possible photo. It said "Mr. Rode was born in July, 1858, and at the age of fifteen entered the Pittsburg office of the Mutual Life Insurance Company of New York, where he rapidly rose to the position of cashier, which he held up to the time of his death." Nowadays the title "Cashier" brings to mind a low-paid store clerk, but in the nineteenth century the cashier was more typically a senior manager. The cashier of a bank had his signature on banknotes along with the President. So I began to wonder - as a longtime manager at the Mutual Life Insurance Company of New York, would his portrait appear in a company history? Many large firms have published their histories, often on a significant anniversary of their founding. I have several bank histories in my own library. So I checked online, and a history exists: Shepard B. Clough, A Century of American Life Insurance a History of the Mutual Life Insurance Company of New York 1843-1943. In no hurry to schlep to a library, I first checked Google Books and managed to find an online copy. I searched it, but found no hits on Rode's name. Only a review of the full book itself would confirm that, but perhaps branch offices weren't covered. "Cashier George W. Rode is a hard worker and a very valuable man for the place. He has been with the western Pennsylvania agency nearly thirty years and is deservedly popular." Rode corresponded with many of the top coin dealers of the day. A postcard from Philadelphia dealer S.K. 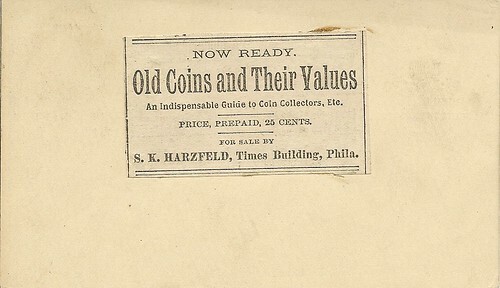 Harzfeld promotes his "Old Coins and Their Values" guide, for sale at 25 cents. It looks as if Harzfeld cut out his ad from some other publication and pasted it on a blank postcard. Just curious: does anyone out there have a copy of this publication? I'm still searching for a photo of Rode. Could he be among the crowd pictured at an early ANA convention? What is the earliest known convention photo? DAVID SKLOW - FINE NUMISMATIC BOOKS offers the Q. David Bowers Research Library Sale Part II on June 12, 2010. Featured lot: UNIQUE SIGNED LETTER FROM WALTER BREEN . www.finenumismaticbooks.com. PH: (719) 302-5686, FAX: (719) 302-4933. EMAIL: numismaticbooks@aol.com. USPS: Box 6321, Colorado Springs, CO. 80934. Contact me for your numismatic literature needs!